Throwing a Fun Party or having a Wedding? Whether you desire elegant Cocktail/Dinner music or a Variety-Party Dance Band that does R&B/Soul/Groove/Latin or 1920s-40s Big-Band Swing & Blues; we'll add the finishing touch to your special event. We cover a wide range of music. Imagine a cool bluesy jazz band filling the air with honeyed tones and Bossa Nova rhythms for cocktails and afterwards, a dance party mix of music 50s, 60s & 70s rock and contemporary songs you'll love. From intimate dinner parties to gala events, openings, weddings, birthdays, office luncheons to throwing a groovy backyard party. We want to liven up your party & help make your special event exciting, fun and memorable. My experience was brillant! I found the Kenzie band through Gigmasters online. I had no previous experience working with or hiring a band in my life. Julie, the bands manager and lead singer made the process easy and seamless. Not only was she a pleasure to work with, but she kept her poise while as I navigated all the ins and outs and details for the event venue. When it came time for song and musician choices. I left it all up to her. She couldn’t have done a better job. :) We are all thrilled with the way the party turned out. The jazz band brought just the right touch of elegance and sophistication we were looking for. Regarding the bands talent. We were blown away Julie’s voice and the rest of the bands talent. She is an excellent singer and the rest of the musicians were 10/10 as well. I will definitely be working with Julie again and highly recomend the Kenzie band for any of your party entertainment needs. Thanks, again to Julie and the Kenzie Band as they made my engagement extra special. Thank you, it was our pleasure. Loved playing The Spoke Club. So glad everyone loved it and had a good time!! Best Wishes and Have Fun in Italy!! I would certainly recommend the Kensie Jazz and Dance band for an event. We used them for an intimate corporate cocktail reception and only had the piano and bass and it was beautiful. The music was great and the band was professional in appearance and behavior. The cost was phenomenal as well, I certainly look forward to using them in the future. I hired The Kensie Jazz and Dance Band for a Holiday work Party. All the guys came way before the scheduled time, which I loved. The music was great and they were all very professional and kind people. I would highly recommend. I am a very organized person and this band is as well. A pleasure to deal with. Very happy, thank you. We had the Kensie Jazz Band play the reception, and they also provided a piano player for the ceremony. The music was a big hit and everyone loved it. The musicians were very flexible and were able to perform one of my own compositions flawlessly. Additionally, communication with the band prior to the event was good. It was very clear what they needed and responses were very timely. I would highly recommend them. Thanks Andrew, very happy you loved the music. It was a beautiful ceremony and a fun dance reception. I am so glad everybody had a great time, it was a very special night for us too. Wishing you all the best for your life together. The Kenzie Jazz Band is absolutely fantastic!!! 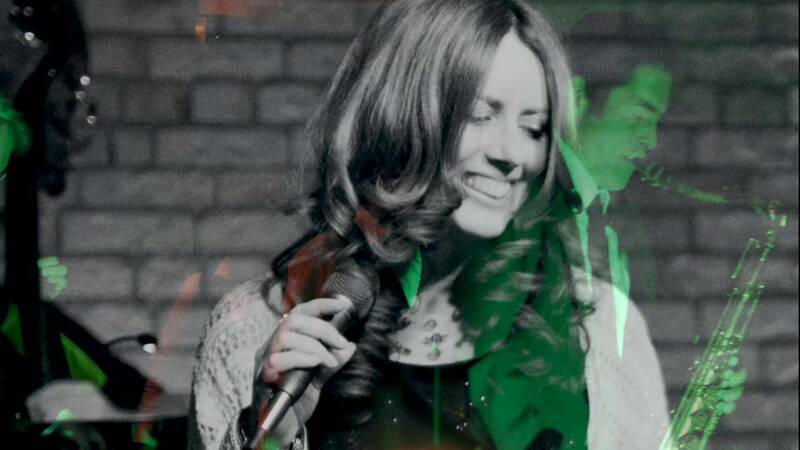 Julie has a smooth, beautiful jazzy voice, and her band members are top notch musicians. Great variety of songs. I highly recommend them for engagements, weddings, or milestone birthdays!!! Thank you so much Justine. So great to meet you and happy you enjoyed the music!! We truly enjoyed having The Kensie Jazz Band at our event. The musicians were excellent and created terrific atmosphere! Thank you Elana so much for the review and for hiring us for your cocktail event in the Imperial Room at the Royal York. Best Wishes! The Kensie band was phenomenal for our wedding! A must have at any wedding to create an elegant affair! Great show for our Christmas office party! The Kensie Jazz band added the perfect mood, sound and energy to our Christmas luncheon. They played a great mix of fun, popular Christmas Songs. The sax and Julie's voice were both amazing.The whole band was outstanding and really made our holiday party a warm and memorable event. They showed up on time, Julie was responsive and made it easy for us. We were happy with the selection of Christmas music and we would love to have them back next year. They were that good! This is the band you want. I highly recommend them, you won't be disappointed. Amazing! Great addition to the evening! They’re performance was just what we were looking for, for our Gatsby themed party, they provided the perfect ambiance without taking away from all that was going on at any point in time. All our guests were amazed, and the evening was beautiful thanks to the jazz band! I booked The Kensie Jazz Band to play at my wedding for cocktail hour, first dance, as well as throughout dinner at the reception. The Band had set up and was ready to go for cocktail hour performances, and performed every song to perfection during the entire evening. Julie has a very sultry and rich voice - she and the Band added such elegance and ambience to the evening! My husband and I received many compliments about The Kensie Jazz Band from our guest throughout the night - booking them was easily one of the best decisions we made for our wedding. Throughout the entire wedding planning process, Julie was very responsive and eased my worries about the big day. I definitely recommend The Kensie Jazz Band for your next event, they are phenomenal! The Band provided great entertainment playing our wedding reception. Our guests loved it! We hired Julie McGregor and her Kensie Jazz Band to play background and dance music at our 400-person reception at the Four Seasons Hotel. They played and sang an ideal music set for the crowd at hand, and were both flexible and competent when it came to working around speeches and a staged dance number. Everyone who commented thought the music was "Perfect - absolutely perfect!" We will definitely come looking for Julie the next time we need a good swing or jazz band! Thank you kindly, Joanne. It was a beautiful, moving and memorable event for us too! If you find this review look no further, this is the best band you need for your event. I had the pleasure to be entertained by Jule and the Kensie Band at my son wedding. The Kensie Jazz Band made our night! The band that was organized for us together was fantastic; I am super honored to have such wonderful music played at our intimate wedding ceremony and for our guests. All my guests enjoyed the music and once again, thank you so much! Fortunately, the band was able to play "I'm Yours" by Jason Mraz and they had greatly accompanied us. Thank you for organizing our night and making it a memorable one. We had the Kensie Jazz Band come again to perform for our Jazz Night and we were thrilled! They are a great bunch of musicians who are engaging and lively. The music they played filled the room and made our event a night to remember! The University of Guelph Faculty Association hosted a Jazz Night where the Kensie Jazz Band performed. The band was lively and upbeat. They engaged with the audience and had us laughing. It was a joy having the band perform and they played a wide variety of Jazz songs. In fact, we enjoyed them so much that we have hired them again to perform at our Jazz Night this year. I highly recommend hiring Julie McGregor and the Kensie Jazz band for your event! My only comment: contact Julie directly to book the band instead of going through gigsalad as this website uses USD instead of CDN currency, which was not indicated (which impacts any Canadians hiring the band). She made the party !!! Look no further- these guys are it! I hired the Kensie Jazz Ensemble to play for our store opening party. With the intention of this celebration to create an elegant, yet fun atmosphere -they could not have been more perfect for this event! They were easy and quick to communicate with beforehand, were on time, professional, and best of all, a wonderful group of incredibly talented musicians. I would certainly hire them for future events, and highly recommend this group! My husband and I booked Julie McGregor and the Kensie Band to play at our wedding reception. We were very impressed at the musicianship and professionalism they demonstrated. The band was unobtrusive during setup and was very responsive to requests. They also provided special lighting throughout the evening, which was a delightful surprise. We received many compliments from the guests on the band's performance. We were thrilled with the Kensie Band and we highly recommend them. Would definitely hire them again! Julie and her band were absolutely amazing! They were on time, organized and dressed appropriately. I had hired them for a corporate gala event at a very upscale convention center. The ambiance of the night was classy, professional and trendy. Kenzie Jazz Band was the perfect addition to this event adding beautiful jazz music that was ideal for cocktail hour. Throughout the process, Julie was very quick to respond and attentive to any needs required by myself and the committee. I would highly recommend them to anyone for future events! 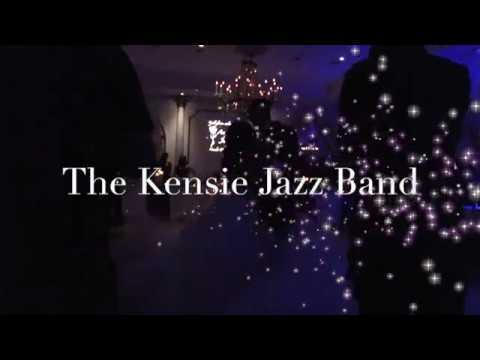 We used the Kensie Jazz Band for our recent party. The band was amazing and included top Toronto jazz musicians. Julie's warm personality and beautiful voice made everyone feel welcome and included. They helped to make our evening something special that everyone will always remember. I give the Kensie Jazz Band my highest recommendation. Had the pleasure of The Kensie Jazz Band for our companies Christmas luncheon. They were amazing. Very professional and the music they provide is fantastic. It was a pleasure Nadia! Happy New Year to everyone there! The Kensie Jazz band were amazing people to work with! They were outstanding performers and the crowd loved them! Our clients and our agency was happy doing business them! They were cooperative and pleasant people. You'd be lucky to work with an outstanding team like this! I hired The Kenzie Jazz Band for my Christmas Party this Christmas. They were fabulous. Piano, Bass drums & Julie's Smooth and Sultry voice was had the crowed dancing the night away. They had a great mix of songs. I would definitely hire them again! Beautiful voice, great songs, fantastic delivery THANK YOU! Discover timeless jazz music to make your special occasion more memorable, and enhance any party with quality and romance. Delight in exceptional, professional performances by expert and multi-talented musicians. 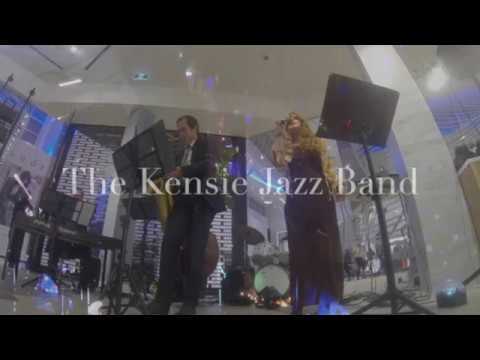 The Kensie Jazz Band or Ensemble will help you add the finishing touch to your own unique and luxurious event whether you need an entertaining, uplifting jazz band or a quiet, cool jazz/Latin/bluesy ensemble. The Kensie Jazz Band or Ensemble experience was created by people who are passionate about music; whether it's smooth and soulful sounds, upbeat swinging jazz or romantic Latin rhythms. We know the slightest musical nuance can change the ambiance of a party, or add beauty and warmth to an evening. We maintain a higher standard of music by selecting fully qualified, well-versed popular and world-class musicians for our bands. Our repertoire covers a wide variety of Jazz Standards that include Swing, Waltz, Latin, Bossa Novas, Sambas, Dance music including a variety of popular covers from 50's oldies, 60's R&B, 70's rock classics, some 80's popular covers and today's music. Besides providing you with great live music, we are able to provide recorded music of your choice throughout your event and during breaks. From intimate cocktail gatherings, to anniversary parties, wedding receptions, company Christmas parties and corporate events, we stand out from the crowd. We will make sure you have the right music that suits your taste and needs. We want to help you make your special event fun and memorable. Our musicians pride themselves on reliability, versatility, and professionalism. We understand the value and importance of live music, and will work with you to create a pleasurable, melodious, and overall unforgettable musical experience. The Kensie Jazz Band features vocalist/leader Julie McGregor along with some of the best and well recognized musicians in Canada. They have been performing for public and private events for 15 years. This amazing band has thrilled audiences at Dundas Square, Four Seasons Yorkville, Hugh's Room, Brassaii, TD Toronto Jazz Festival, Centre Island, Dundas Square, The Richmond Hill Centre for Performing Arts and the TIFF Building. They recently performed at corporate parties for Facebook, Sumsung and Campbell's Soup to name a few. Julie is also the host and jazz vocalist of the popular 'Singer's Jazz Series' which has been performing to sold-out shows for over 6 years. 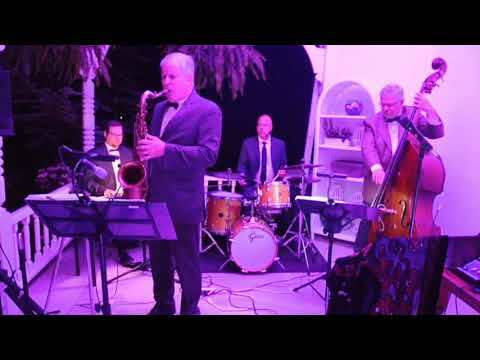 Whether you desire elegant, luxurious music for your wedding ceremony, soft, romantic jazz trio for background dinner music or some upbeat swing full dance band that includes a variety of music for your corporate party or family celebration, The Kensie Jazz Band is able to provide the right music to create your ideal atmosphere. Available for cocktail/dinner parties and gatherings, to anniversary parties, weddings, wedding receptions, birthdays, festivals, jazz concerts, Hollywood jazz-themed events, Marti-Gras, 1920s, 30s, 40s swing dances, Oldies 1950's, 60s, 70s Soul/R&B, outdoor events, Christmas and Holiday luncheons, corporate functions or just throwing a party. We want to thank you in advance for supporting live music!! We have an electric keyboard if the venue doen't have a piano. The band needs to be situated near electrical outlets or power. Do You now What It Means To Miss New Orleans?